The inaugural Malaysian Grand Prix saw Michael Schumacher back into action for Ferrari for the first time since his leg-breaking accident at the British GP in July. After weeks of being less than impressive the Ferraris - or at least Schumacher's car - were suddenly fast again. 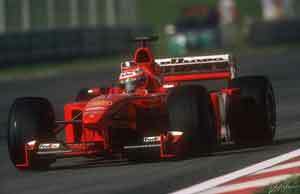 Schumacher was so fast in fact that he was a second ahead of the two McLarens in qualifying. Irvine was alongside him on the grid and the McLarens of David Coulthard and Mika Hakkinen were third and fourth. Then came a revitalized Johnny Herbert, much more motivated after his win at the European GP three weeks previously. Herbert's Stewart-Ford team mate, Rubens Barrichello, was sixth on the grid. In the race Schumacher went off in the lead with Irvine having trouble keeping Coulthard, Hakkinen and Barrichello behind him. On lap four Schumacher slowed and allowed Irvine to pass him and then proceeded to block Coulthard and the others. David was in no mood for such behavior and on the next lap he forced his way past the Ferrari and went off in pursuit of Irvine. He was challenging for the lead when his car broke down. Back in second place, Schumacher slowed down again to allow Irvine to get an advantage. Then, needing to stay ahead of Hakkinen during the pit stops, Michael accelerated the pace in order to build a lead. Realising this, McLaren took a risk. They gave Hakkinen half a tank of fuel and hoped it would be enough to get him out of the pits ahead of Schumacher. The gamble failed. Schumacher blocked Hakkinen again and the gap to Irvine went up to around 20secs. Irvine did not have a big enough advantage to stay ahead at his second stop but Ferrari was sure that Hakkinen would have to stop again. He did, emerging in fourth place behind Herbert. Schumacher slowed again to allow Irvine to take the lead. Hakkinen could do no more than force his way past Herbert to take third place. After the race the Ferraris were found to be illegal by an FIA official. The stewards agreed. The Ferraris were thrown out, which - in theory - made Hakkinen World Champion. Ferrari appealed and the FIA Court of Appeal in Paris later ruled that the cars were not illegal and that the measurements taken had been wrong. The two Ferraris were reinstated.